(Nanowerk News) Astronomers have measured the spin of a black hole buried in the heart of a galaxy located 56 million light years away, and discovered it was spinning quickly – about as quickly as it could go. That was the big news, based on a paper in Nature ("A rapidly spinning supermassive black hole at the centre of NGC 1365"), in recent days. So how did the astronomers make their measurement? And what does it mean? For a long time, black holes were nothing but a theoretical curiosity, but from the 1970s it became clear there were spots in the universe where observational properties could only be due to the presence of an immense gravitational field. Within our own galaxy, there are lots of black holes with a mass similar to the sun, but over the last 15 years it has become apparent that hearts of galaxies host supermassive black holes with masses many millions and billions time that of the sun. Supermassive black holes are far too small to be imaged by any telescope we have; and to compound matters, to state the obvious, they are black. But, though physically small, their immense mass ensures their gravitational pull reaches out into the galaxy. By measuring the speeds of stars orbiting near these central black holes, we can determine the gravitational forces acting on them and measure the mass. This has been spectacularly successful in our own Milky Way, where astronomers have pinned the mass of the central black hole to be more than four million times the mass of the sun. At such large distances, the gravity the orbiting stars experience carries no information about how quickly the black hole is rotating, and so – to measure this – we need to get a lot closer to the hole, into the regime where gravity no longer resembles the simple laws of Newton. At this point we have to worry about the relativistic effects of Einstein. In 1963, the New Zealand mathematician Roy Kerr cracked the equations for spinning black holes. At large distances, spinning and non-spinning black holes have the same influence on orbits, tugging on stars in the same way. But as we get closer, the effects of relativity grow, and we find the spinning black hole gives space-time a twist not seen around stationary black holes. And the more a black hole spins, the more space-time is twisted. Such space-time twists influence the motion of stuff moving close to the black hole, and by tracking nearby orbits we can work out the spin of the black hole. And in this respect we’re lucky: falling material rarely drops straight in, but tends to miss and ends up orbiting before making its final plunge. Because of the above, some supermassive black holes are surrounded by immense, brightly-glowing accretion disks, with material whizzing around, heating through friction, at speeds approaching that of light. 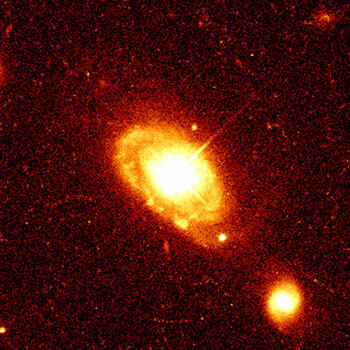 But, even with our best telescopes, all we see is an intense point of light at the heart of a galaxy. So how can we ever see how the accretion disk is moving, and hence work out the spin? The high temperature of the disk ensures elements such as iron atoms glow brightly, producing sharply-defined emissions of X-ray radiation. The rapid rotation of the disk means some points are moving towards us, and some away, and the well-known Doppler effect works to change the observed energies of the X-rays, broadening the emission line we observe. So we can measure the speed of the disk rotation. But as any good car-salesman will tell you, there’s more. We have to remember that as this hot material spirals in towards the black hole, the effects of relativity grow larger. With that in mind, two key features have to be considered. The first is the concept of an “innermost stable orbit”. In Newtonian gravity, you can safely orbit, without having to use rockets to support yourself, at any height above a massive object. While this holds for larger orbits around black holes, for material that strays too close, there are no stable orbits and material simply falls in. If we imagine Earth had an innermost stable orbit at 1000km above the surface, satellites we launched to 1,001km would happily orbit, but those at 999km would simply fall back to Earth. The existence of an innermost stable orbit means there is a gap in the middle of the accretion disk, a demarcation where matter can happily orbit beyond this distance but rapidly spirals in when the radius is crossed. Remarkably, the size of the gap depends strongly on the spin of the black hole, with the more twisted space-time of a highly-rotating hole allowing material to orbit closer than that of a stationary black hole. But material getting closer orbits faster. So if we can see how quickly material is moving (which we determine from the widths of the iron lines) we can start to measure the size of the gap. The second effect dictates how photons from the accretion disk travel to to telescope. While classical physics tells us that rays travel in straight lines, the warped gravity of Einstein’s relativity means that photons can follow complex paths after being emitted, twisting and turning as they climb away from the disk. Combining these effects means that the nice sharp peaks of iron emission are broadened and distorted, and the shape of the distortion tells us how much the central black hole is spinning. And this is precisely what is measured. We know the supermassive black holes in the heart of galaxies must have been born in the earliest epochs of the universe, probably in the deaths of the first generation of massive stars. Travel inside a black hole. These “seed” black holes must have had masses not much larger than a few hundred or thousand times that of our sun, and so to reach the masses of millions and billions of solar masses, they must have grown rapidly, feeding on in-falling material. It is therefore thought such black holes must have grown with their host galaxies forming around them, and the flow of matter into one is implicitly tied with the flow of matter into the other. And as matter doesn’t simply fall directly in, the spins of the host galaxy and central black hole should be similarly related. So understanding the spins of central black holes gives us clues to how large galaxies, such as our own Milky Way, came into being. How’s that for a positive spin!